Earlier today, the Dalai Lama drew crowds in Taipei as he met with Taiwan's senior prelate. 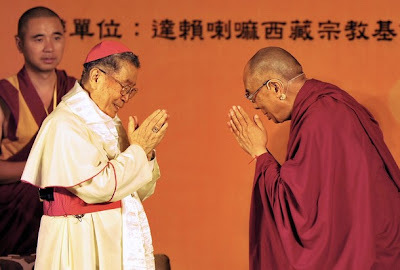 The exiled Tibetan leader held a two-hour long public dialogue with Cardinal Paul Shan Kuo-Shi SJ that, according to early reports, delved into Christianity and Buddhism's similarities and differences alike. Now 85 and recently diagnosed with lung cancer, Shan -- the island's first-ever red-hat -- retired as bishop of Kaohsiung in 2006. While much of the Nobel Peace laureate's weeklong visit was dedicated to leading prayers after a typhoon last month killed 700 and displaced thousands more, the displeasure of the mainland Chinese authorities over the trip has led to a cancellation of several events, including a press conference. The Dalai Lama's rare reception by a leading Catholic prelate comes as the Taiwanese church celebrates the 150th anniversary of the island's first evangelization, for which its bishops have set the ambitious goal of baptizing 15,000 new converts. While Pope Benedict declined an invitation to visit Taiwan for the yearlong observance -- a move largely due to the Vatican's reluctance to inflame its own gradually warming relations with Beijing -- the pontiff called its church to calm in the public square late last year, telling the island's bishops that "one need not fear to be a faithful Catholic and a good citizen." Based in Taipei, the Holy See's lone diplomatic mission to any part of China is headed by Msgr Paul Russell, a priest of the archdiocese of Boston.